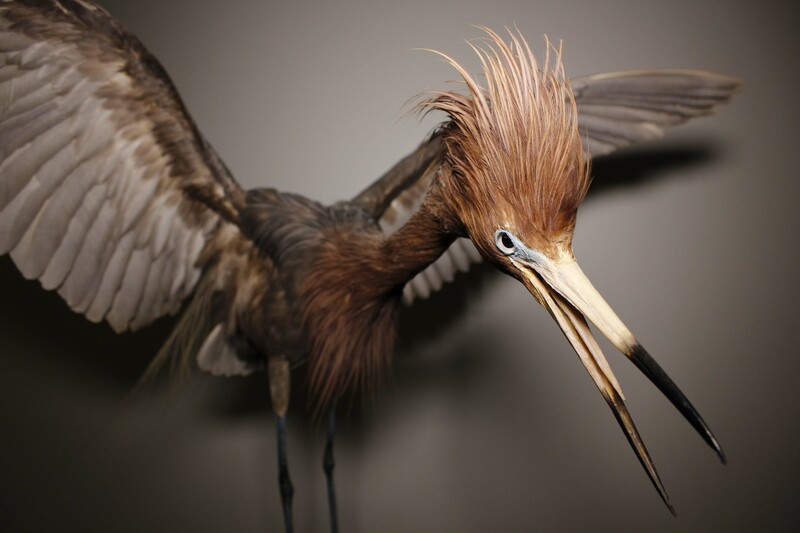 If you are interested in birds and have yet to visit Unshelved: Cool Stuff from Storage, our exhibition that reveals specimens from our hidden storage areas, you need to hustle on over and check it out. A stroll through Unshelved quickly reveals an abundance of “all things birdy” to appreciate, including more than 46 birds, 6 nests, and no less than 24 sets of bird eggs. 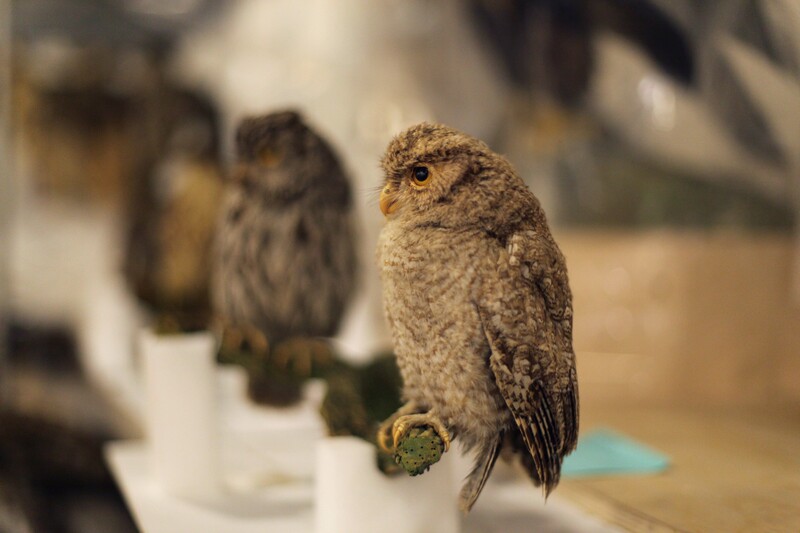 And if you love taxidermy, this is definitely the exhibition for you. There are taxidermy specimens of majestic Sandhill Cranes, a tiny, jeweled Calliope Hummingbird, and a spectacularly colored Military Macaw. The delicate feathers of a huge Great Horned Owl reside in a case adjacent to an exquisitely colored California Quail. The paradox with birds is that although they exist all around us, every day, we so rarely are able to truly see them. Dazzling treasures of nature in our midst, they are always in motion, on the wing, and therefore astonishingly beautiful when we are able to look at them from a distance of mere inches, rather than so far away, on a distant tree branch or flitting though the bushes. What new factoids can you learn in Unshelved? You can see how perfectly camouflaged the eggs of the Elegant Tern are. These birds lay their eggs right on the ground, on bare sand, with no nest to protect them. Imagine how vulnerable they are to predators. However, the eggs are spotted and mottled to blend in spectacularly well with the ground. And who knew that the Black-chinned Hummingbird’s miniature nest could be identified by the presence of soft fuzz gathered from sycamore leaves? Our Curator of Birds and Mammals Dr. Phil Unitt, that’s who. 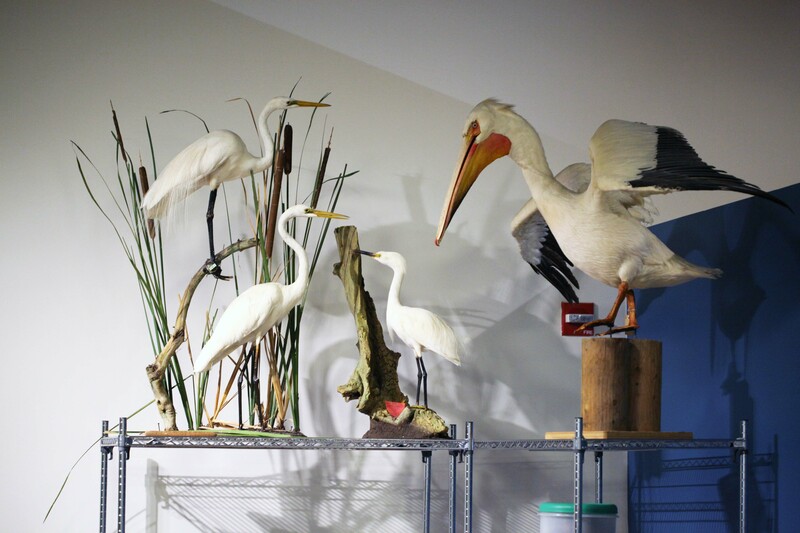 The bird collection he oversees is stored in massive compactors that exist behind the gallery walls on Level 3 of the Museum. This collection now consists of more than 50,900 specimens and is in carefully maintained order. The vastness of the collection coupled with the sight itself is awe-inspiring. The large-scale storage containers are not as surprising when you remember that despite the petite size of many of our songbirds, the collection has also been built to house birds of such significant size as the Emperor Penguin, which stands as tall as 4.3 feet, and is on view in Unshelved. Phil, a native San Diegan, has been at The Nat for 30 years, and is a walking, breathing encyclopedia of all things birds. He authored the 639-page San Diego County Bird Atlas in 2004, which represents over five years of intensive field research. Phil also has served as editor for the journal Western Birds since 1986. If there is a question that Phil cannot answer about local birds, then it is definitely one not yet known to science. Come view some of the treasures Phil has cared for over the past 30 years in Unshelved, and share in the wonder! Posted By Director of the Research Library Margaret Dykens.